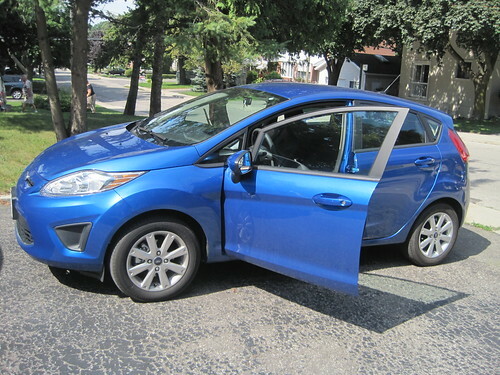 All week I've been driving a 2011 Fiesta 5-door hatchback SE. Ford doesn't care what I write about these cars they lend me, so I assure you it's without bias when I tell you I'm loving this car. It's just so much fun to drive. No, there's not a lot of power, but I honestly don't care. It's compact, but still roomy and comfy. My family of four fits perfectly fine, and scooting around in this gas saver is a treat. I only have a couple more days with it, so tomorrow we're road tripping just to get more time in the Fiesta. There aren't a lot of bells and whistles, but the Sirius satellite radio is quickly becoming an extra I don't know how I live without. I'm loving this car. My Mazda Protege has about 230,000 kms on it, and I know it won't live forever. When she passes on, and I'm in the market for a replacement, I'm going to seriously consider this Fiesta. I don't want to give it back. I was there - in that early '09, pre Toyota-recalls, year of despair - replying online to one of Canada's leading journalists, David Akin, about the inaccurateness of the oft referenced 20-year model sales, foreign vs. domestic car, stats. Now I am seeing good steady family man Mike test driving a free new car two summers in a row; in fact, TWO Ford vehicles this summer. And here I've gotten nuthin. Okay, Toronto Mike, back to you. Actually, three summers in a row, but who's counting. And Thanks for the correction! When was the last time a Ford compact car was one of the most desirable cars in its class? It's hard to remember, but out comes the Fiesta and it changes the landscape. It's a great car without cheap gimmicks. Ford needs to add a performance version.